Developed in the late 1970s, the Christen Eagle II set a new mark of excellence for home built kit aircraft. The Eagle II, based on the famous Pitts Special, was designed by Frank Christensen as an unlimited class aerobatic aircraft that could be used for competition, advanced aerobatic training and sport cross-country flying. Since its introduction, more than a thousand Eagle IIs have delighted their owners and found homes with both professional and amateur pilots alike. Frank Christensen was a self-made millionaire even before he entered the aviation industry. Prior to his aviation career, Christensen built inverted oil systems for Curtiss Pitts. This experience led him to begin thinking about developing a home built aerobatic aircraft that anyone could safely build and fly, regardless of their background in aircraft construction or engineering. After his bid to buy the Pitts aircraft line failed, Christensen set his plans to open his own aircraft company in motion. The Eagle II debuted at the 1977 Oshkosh Fly-In and was immediately popular with both professional and amateur aerobatic pilots. After test flying the Eagle II, World Champion Aerobatic Pilot Bob Herendeen stated; "All in all, I like the very light feel of the controls of the Eagle II. Its responsiveness and roll rate give one the feeling of flying in a Pitts S-1S, but with stability more like that of the Pitts S-2A. The clean, comfortable cockpit area and control stick position are ideal. I don't see how anyone would not like this airplane." The first Eagle II kits cost roughly $40,000 (minus a paintjob). By 1982, Christensen had sold nearly 500 kits. The Eagle II set a new standard for home built kit aircraft. 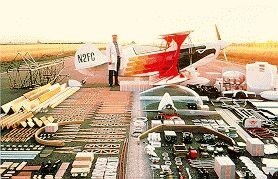 Unlike most home built aircraft, which start with only a set of plans and perhaps some building materials, the Eagle II kit contains nearly 30 individually packaged "sub-kits" that are assembled in numerical order (without the need for any welding). Even the Eagle II's flight manuals and assembly directions come computer "published" in three-ring binders. The Eagle II's simplicity and Christensen's remarkable "total concept" design have given the Eagle II kit a remarkable completion rate of nearly 90 percent. The Eagle II is really much more than a high-performance, two seater aerobatic airplane you can build at home. It's a whole new approach to homebuilt aircraft construction. The picture above illustrates this. Here you see portions of the 24 kits required to build the Eagle II. Each kit contains a separate section of the aircraft, and every part; every piece is available today. Each section contains a comprehensive manual detailing the construction methods through diagrams and instructions. Being a kit aircraft, the Eagle allows a certain freedom of creativity when building. The original colour scheme is so popular that most Eagle's you see will likely look the same, however, several owners have opted for their own colour choices and some don't even have the Eagle logo at all, perhaps the most interesting thing that has been done is the addition of the 6-cylinder Lycoming 540!